(Omaha, NE) — All the rage! Gas pumps & pretroleum products used at the end of the 19th Century & beginning of the 20th have become an antique collector’s favorite. Forget the swap meets & ebay. Webers Nostalgia Supermarket & Gas Pump Heaven restores the old and replicates top brand antique gas pumps, parts & accessories that are reminiscent of the glory days in America. In the 1880s, the Bowser Company in Fort Wayne, Indiana built the first gas pumps which included pumps that could pull fuel from an underground tank. The earliest pumps were not located at gas stations, as we know them today, since back then, there were few. They sat at dealerships, along sidewalks or at curbs. These gas pumps sprung up everywhere in the 1920s as automobile ownership grew in popularity. The first gas pumps were called visible gas pumps, which contained a clear glass cylinder allowing the vehicle owner the ability to see if the gas was clean. Dirty gas contaminated with foreign matter or water was an issue in that era. How did the electric gas pump work? Gravity & a human hand would pull back and forth a long handle which pumped the fuel from an underground storage tank into the cylinder. Gasoline then flowed from the 8-to-10 feet tall cylinder down the hose into the vehicle. After the visible gas pump, emerged the electric one known for housing a clock face in the 1930s & globe top with the name of the gas supplier. Like the visible pump, the electric gas pump was made to show the buyer what the fuel looked like using what’s called a sight glass. Electric Gas Pumps were made with a fan inside of it. The early ones calculated the gallons of fuel that went from pump to car. The seller would then compute the price in his head. In the 1930s, 40s & 50s, oil & gas manufacturers made self-computing gas pumps, which stated the price by themselves. The most sought after antique gas pumps are the ones from the 1930s which show the fuel. 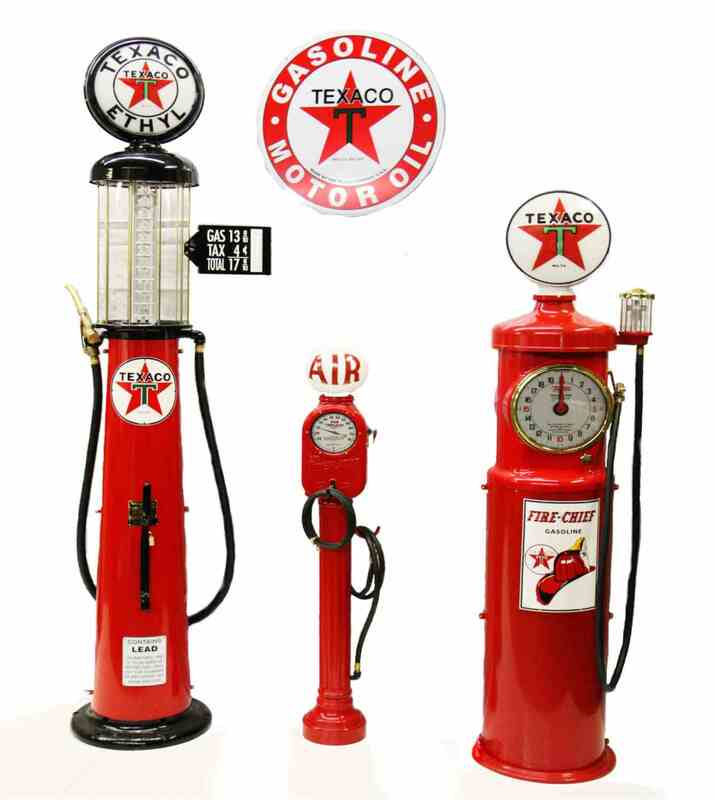 Vintage Gas Pumps from the 40s & 50s are also popular, the latter of which are more boxy, yet easy to the eye, as well. Editor’s Note: Nostalgic gas station photo (far right) courtesy of the Vintage Gas Station Museum.